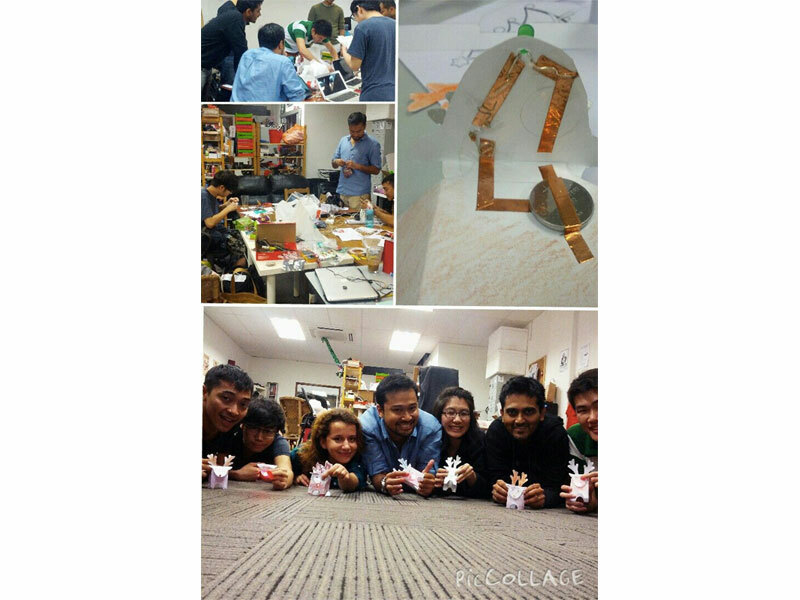 HacKIDemia was back again in Singapore for the holiday season and we ran four sessions of it - on 13th, 14th and 20th December led by Fazli Mansor, Luther Goh and Balaji Ramanujam. The sessions attracted over 160 registered children and students together with their parents at 3 especially befitting locations, namely the IDA Labs at the National Design Centre, the ArtScience Museum and also the Little Arts Academy. The mentors were gathered a couple of days before the event for briefing at Hackerspace.SG, getting to know each other and also to explore ways to engage and interact with the participants. We were lucky to have had Stefania herself guiding us through the mentor session to ensure everyone would have fun and geared up to have a lively learning and creative experience. The first session on 13th Dec 2014 was held at the National Design Centre for 8 to 16 year olds in the morning. The children learned how to have fun combining paper crafts full of colour and shapes together with basic circuitry through sticky copper tape, batteries and LEDs with our Christmas themed templates - Reindeers with LED noses, Snowflakes lighted up by a LED and Christmas tree with a LED on top. They also experienced making music with the MakeyMakey and fruits, how to make an automated waving hand with the LittleBits kits, programming the Arduino to make running lights and also some basic Raspberry Pi programming with Scratch. On the afternoon of 13th Dec, the mentor team shifted all the equipment and tools to setup at the ArtScience Museum. It was also happening at the same time as the Leonardo Da Vinci showcase there. So for two afternoons over that weekend, children of all ages some pre-registered - some walk-in joined the fun to learn about making more paper circuitry and the different platforms they could create with together with their enthusiastic parents. The week after on the 20th Dec 2014, the learning adventure continued at the Little Arts Academy specially for children below 8 years of age. The sessions ended with raving reviews from the parents and children whom are looking forward to the next HacKIDemia and especially those who have already volunteered as mentors in some of the sessions. The mentors certainly enjoyed the sharing sessions and fostered new enthusiasm to continue building the community. Special thanks to all who have supported especially our venue sponsors, ArtScience Museum and IDA Labs @ NDC, all mentors, parents who willingly spent their weekend to be together with their children and supporting the HacKIDemia sessions. Do join the group https://www.facebook.com/groups/sghackidemia to follow the updates in Singapore. See you in the upcoming HacKIDemia! Ending off with a Mentor's lunch to celebrate the successful event!